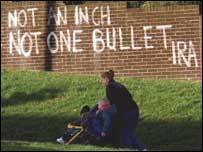 For years the writing on a Belfast wall read: "NOT A BULLET - NOT AN OUNCE". It was the republican way of saying "no" to getting rid of its weapons and explosives. But, in a process designed to end conflict, this position was never tenable. The political business of power-sharing could only be sustained if unionists were convinced that the threat of the IRA's gun was gone, and gone for good. So, slowly, the IRA has moved to this position, not at a pace dictated by the British government or the unionists, but in its own time. In July, the leadership of the republican organisation ordered an end to its armed campaign, and the follow-up to that statement has been Monday's announcement that the decommissioning process has been completed. The Sinn Fein leaders - Gerry Adams and Martin McGuinness - have taken the IRA to this new position without there being a major split in the organisation. That has been the major republican achievement - and the internal IRA priority - throughout this process. The first IRA meeting with General de Chastelain's Independent International Commission on Decommissioning (IICD) was in December 1999. 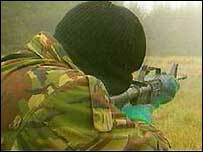 Then, in October 2001, the first IRA arms were put "beyond use". Before Monday's statement, there had been two other acts in April 2002 and October 2003. It has been a process conducted in a dark corner. The IRA has done it in its own way, resisting unionist demands for video and photographs. What was different this time was the extent of decommissioning and the fact that the process was seen not just by General de Chastelain and his commission colleagues Andrew Sens and Tauno Nieminen. It was also seen by church witnesses - Catholic priest Father Alex Reid and former Methodist Church president, the Reverend Harold Good. So, there were new watching eyes - and we now wait for how their commentary on events impacts on a listening and watching public. The DUP had wanted the former moderator of the Presbyterian Church, David McGaughey, as a witness but the IRA decided otherwise. The bulk of the IRA's weaponry was Libyan supplied. Semtex explosives, surface-to-air missiles, rocket launchers, machine-guns, rifles and handguns - tools of war smuggled into Ireland in the 1980s. But a string of chief constables in Northern Ireland - Sir Hugh Annesley, Sir Ronnie Flanagan and Sir Hugh Orde - have acknowledged that the biggest threat the IRA poses is its "engineering knowledge" - something that cannot be decommissioned. The process of IRA decommissioning "is complete"
Within its ranks, the republican organisation has always had men and women capable of manufacturing a range of improvised weaponry, including bombs, mortars, grenades and rockets. That know-how has always been there. Yes, the process that General de Chastelain has overseen may well have "put beyond use" those Libyan-supplied and other weapons mentioned earlier, but it has not removed the IRA's capacity for "war". The political alternative to "armed struggle" argued by Adams and accepted by the IRA leadership now has to flower. That means Ian Paisley's DUP doing political business with Sinn Fein. It means the demilitarisation of Northern Ireland society, and it means finding a system of policing that republicans will be prepared to endorse. The past few weeks have produced IRA words and actions unprecedented in this current republican campaign. Monday's statement signed by the IRA's nom de plume, P O'Neill, should be the last of that campaign, and that is an indication of how things have changed in this long and slow peace process. "That means the DUP doing political business with Sinn Fein"
The focus will now switch to the loyalist organisations. In recent months, the guns of the Ulster Volunteer Force and the Ulster Defence Association have been heard. 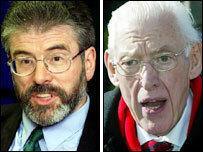 And the challenge now for the leaderships of those groups is to match what the IRA has done. The sequence of statements from the IICD, the church witnesses and the IRA tell a story of very significant progress, but there is more work for de Chastelain and his team. There are more guns in Northern Ireland.